One of our mantras at Divvy is to help people work smarter, not harder (hence the content marketing software). And in the world of content marketing, content repurposing is a great way to take a piece of evergreen content that you slaved over in the past, dust it off, repackage it in the popular content format of the day, publish it and then watch as your audiences embrace it as if it were a new piece. Such is the case with a helpful little blog post that I wrote back in March of 2011. In early 2011, I was asked to guest blog for the Content Marketing Institute, which actually came from a consistent blog commenting strategy that I have executed for years. With their heavy focus on “how-to” content, I whipped up a post on the “12 Things You Need to Do After Writing a New Blog Post”. The checklist-style post was well received with thousands of retweets, likes and shares. Now fast forward to March 2012. The infographic craze is in full swing, so I was perusing my content archives looking for something that I could turn into a good visual. I quickly recalled many CMI comments talking about how they had printed out the text-based checklist and had it pinned to their cube wall. BINGO! The rest is history…in the making. Click the infographic above to open the PDF version. Save it to your computer/hard drive. Open the PDF in Adobe Acrobat or any PDF Reader application. In the PDF print setting dialog box, look for “Tile Scale” or “Print Scale” and set the percentage to 54%. 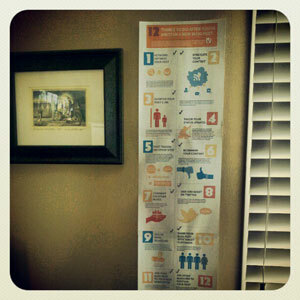 Your print preview should now be showing that the infographic will print on three 8.5 x 11 sheets. If not, adjust the scale percentage until it fits. If you need help managing your blog or social media activities, you may want to try our 14-day free trial. Special thanks to Micaela Clarke, design intern at Brockton Creative Group, for helping on this fun little project. We’d love to see these hanging on your wall! Take a picture and put a link in the comments or post it on our Facebook wall!